What a great time at our 35th Reunion! Cheers to everyone who came. For those that did not, we missed you. 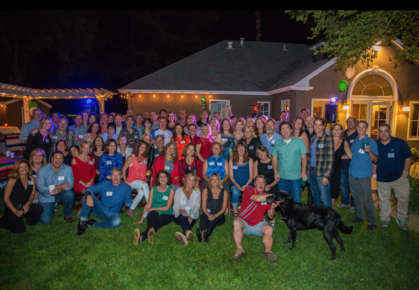 And for ALL of you, here is the link to view PHOTOS FROM OUR 35th REUNION. If you would like to download any images for free, simply right-click on the image. Or, use promo code "PALY50OFF" to receive 50 percent off the price of professional prints (expires December 11). A huge shout out to Andrew Baum, who organized the photographer and prepared this MEMORY VIDEO that was shown at the reunion. I know we've said this before, but perhaps cannot say it enough: Thank you Jerry Scher for opening your home yet again and to Nan Hagan for taking the reins on the pre-party, which was totally different and awesome. (Hang onto that sound system because I'm sure we will want to do that again.) And to the rest of the reunion planning team: you all are terrific! We have dedicated our Legacy Fund to establishing a college scholarship fund for Paly graduates in memory of Principal James Van. Jeannie Crumley Cole is working with Mr. Van's widow and others to iron out the details. Given the cost of college education, we feel that it is the best way to keep his memory and the values he represents alive. A big THANK YOU to everyone who has contributed during our last two reunions. When we are ready to announce the fund, we will provide you all with more details and additional opportunities to contribute. Lastly, if you know ANY classmates that are NOT registered on this website, please encourage them to do so. We are working hard to keep this current so that we can sustain our bond as the years march on.